Kroger is launching a pilot program later this year to test the autonomous vehicles. They may resemble giant metal toasters on wheels, but these strange-looking vehicles could one day save you a trip to the supermarket. The American grocery store chain Kroger is teaming up with Nuro, a Silicon Valley-based robotics company, to test a fleet of robotic cars this fall in a yet-to-be-announced city. The new autonomous technology is designed to meet changing demands in the grocery market. “Our customers are increasingly wanting different ways of fulfilling their food and shopping needs,” said Yael Cosset, Kroger’s chief digital officer. The deliveries will be carried out by Nuro’s R1 car bots, which have a top speed of 25 miles per hour, stand 6 feet tall and measure about “half the width of a Toyota Corolla,” Nuro CEO Jiajun Zhu told NBC News MACH in an email. The vehicles will navigate to a customer’s home using sensors, radar and cameras strapped to the roof. When the car arrives at its destination, customers will be notified and sent a code to unlock the gull-wing doors to unload their goods. For the first tests, Zhu said they will "use regular cars outfitted with our autonomous driving technology" and then eventually transition to fully driverless vehicles. This shift has given rise to grocery delivery startups such as Peapod and FreshDirect, and seen giants like Amazon — with its acquisition of Whole Foods — and Walmart expand their online grocery options. Bill Bishop, co-founder of Brick Meets Click, a Barrington, Illinois-based consulting firm that analyzes changes in the grocery industry, said he was surprised by Kroger’s announcement because driverless technology remains relatively unexplored in the food retail industry. But he added that the decision reflects broader trends moving away from “mass retail to personalized retail,” with new technologies offering consumers a more individualized shopping experience. Self-driving cars are slowly making their way onto American streets, but regulations governing their use are still being established. Eleven states and Washington, D.C., allow driverless cars on city roads but only five states don’t require a safety driver onboard, according to the Insurance Institute for Highway Safety. Test programs for self-driving cars are underway in several states, including Massachusetts, Pennsylvania and California. 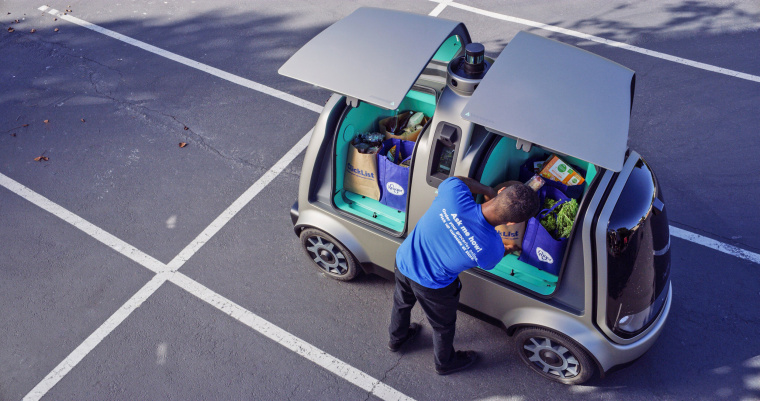 While a completely driverless future may be years — or even decades — away, Cosset said that one of the primary goals of Kroger's pilot program is to understand how people engage with autonomous delivery vehicles. “We have done some primary research with customers to kind of determine their willingness to interact with autonomous vehicles, and it's been very positive but as we always say, ‘It's one thing in a lab environment, it's very different when it's in a real-life context,’” he said. Kroger and Nuro have narrowed down a shortlist of cities to launch the program. Their decision will be determined by the “geography, topography and climate of an area; the locations of the potential stores; and the regulatory environment,” Zhu said.